An Easy One-Skillet Spicy Taco Shrimp Fajitas prepared in 30 minutes and served with gluten-free tortillas. A delicious everyday dinner (or a great excuse to put together a taco/fajita bar for entertaining)! Couple’s goals: make everyday occasions a little more special! 😉 Believe me, in my case it can sometimes be more of a challenge on account of my heavy work routine. But this week my husband and I decided to make more time for ourselves as a couple regardless of whatever might come on our way. I mean, we had these super delish One-Skillet Spicy Taco Shrimp Fajitas that are easy to make in 30 minutes or less. It may sound like an everyday dish — and it is, but we made it special by putting a small taco/fajita bar together. It was accompanied by a bottle of Sutter Home White Zinfandel, which pairs perfectly with our spicy dish, and is so affordable. The dish is my take on Tex-Mex cuisine, since I have been living in San Antonio for almost 11 years. As a multicultural family (both American and Latin), we enjoy Tejano culture and food, including at special moments. This recipe is quick and just as simple as you please! It’s prepared with staple ingredients available at many local supermarkets. Start by heating a large cast iron skillet over medium heat. 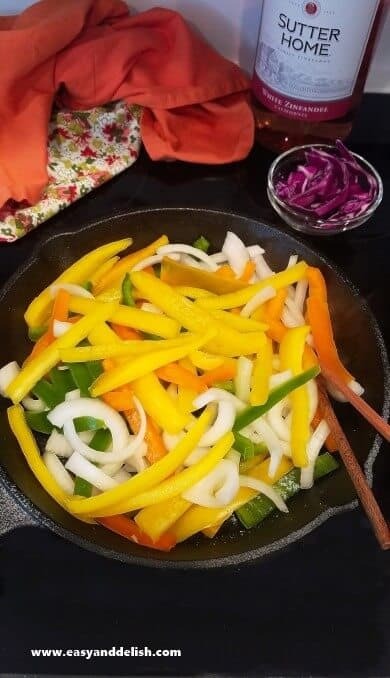 Add vegetable oil and then cook bell peppers cut into strips and onion (purple cabbage as well if desired) for about 6 minutes. Season with salt and pepper and place onto a plate. Then add a bit more oil to the pan and cook shrimp seasoned with a mixture of taco seasoning and chili pepper for about 4 minutes. Sprinkle on lime juice. 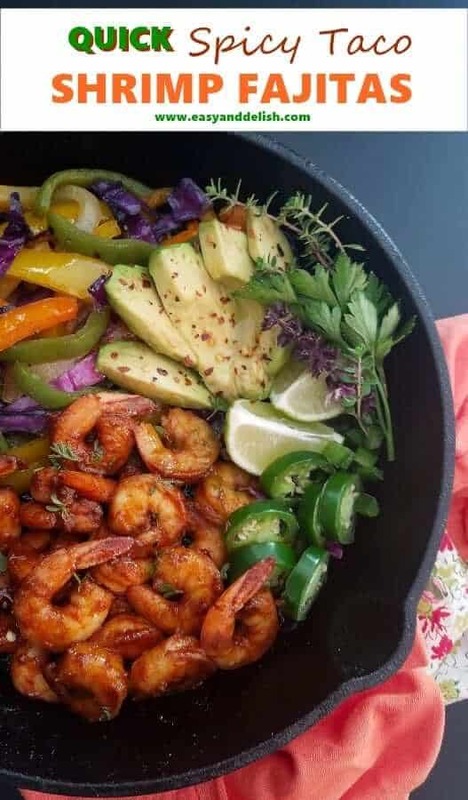 Last, arrange cooked shrimp and vegetables in the skillet, add sliced avocado, jalapenos, lime wedges, and fresh cilantro or parsley. Serve with gluten-free tortillas and enjoy! And of course, these are perfect for savoring with Sutter Home White Zinfandel or other Sutter Home Varietals — the perfect choice for every occasion! Why? Because Sutter Home is a family-owned company that has been around since 1948. Moreover, it has received over 400 gold medals. producing affordable quality wines in California that bring people together to share good times. With so many different wine varietals, Sutter offers something for everyone. 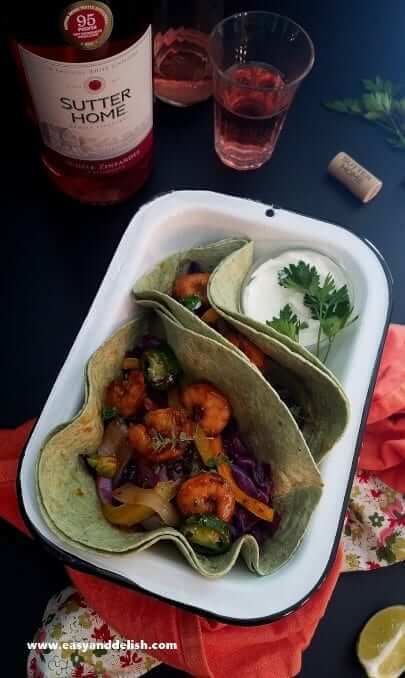 ON A SMALL TABLE, COUNTER TOP OR COFFEE TABLE: Lay out skillet of Spicy Taco Shrimp Fajitas, serving silverware, and tortillas placed inside of a tortilla basket to keep them warm (or alternatively, a platter covered with a warm clean napkin and aluminum foil). Also, lay out some paper baskets to arrange tacos in, or dinner plates, napkins, wine glasses, and a bottle of chilled Sutter Home White Zinfandel. If desired, a vase of flowers and voila! Great moments don’t have to come accompanied by a load of work. Agree?! 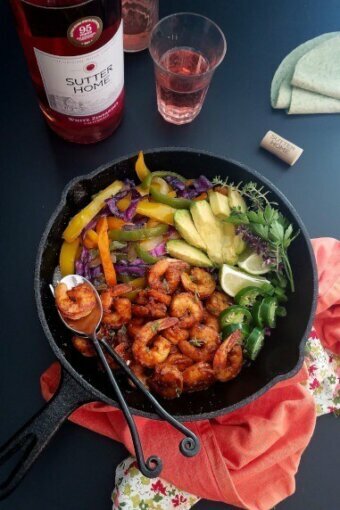 Well, to learn more about the varietals and to see more delicious recipes like our One-Skillet Spicy Taco Shrimp Fajitas, visit the Sutter Home website now. An Easy One-Skillet Spicy Taco Shrimp Fajitas prepared in 30 minutes and served with gluten-free tortillas. A delicious everyday dinner or (a great excuse to put together a taco/fajita bar for entertaining)! Heat a large cast iron skillet over medium heat. Add 1 1/2 tablespoons of oil and cook bell pepper strips and onion for about 6-8 minutes or until softened. Season with salt and pepper and place onto a plate. Last, arrange cooked shrimp and vegetables in the skillet, add sliced avocado, jalapenos, lime wedges, and fresh cilantro or parsley. Serve with gluten-free tortillas and enjoy! 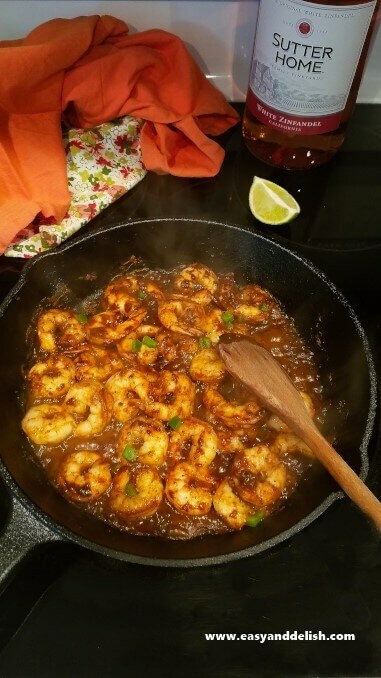 Then add the remaining 1 1/2 tablespoons of oil to the pan and cook shrimp seasoned with a mixture of taco seasoning and chili pepper for about 4 minutes or until cooked. Sprinkle on lime juice. 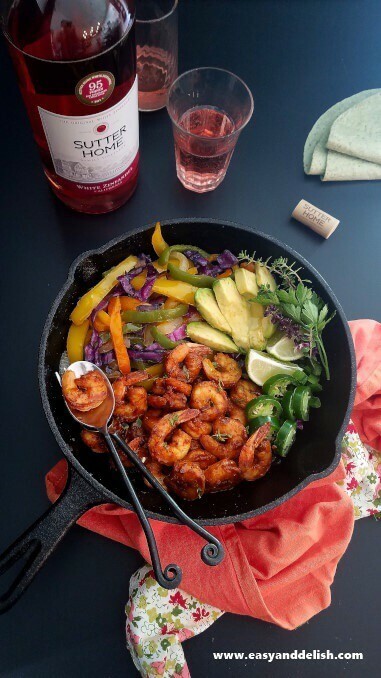 Last, arrange cooked shrimp and vegetables into the skillet, sprinkle with cilantro, add sliced avocado, jalapenos, and lime wedges. I used store-bought gluten-free spinach tortillas, but you can serve with any tortilla of your choice. 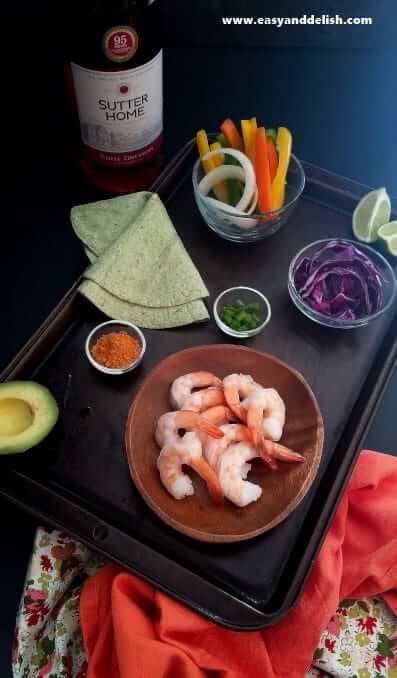 ON A SMALL TABLE/COUNTER TOP/COFFEE TABLE: Lay out skillet of Spicy Taco Shrimp Fajitas, serving silverware, and tortillas placed inside of a tortilla basket to keep them warm (or alternatively, a platter covered with a warm clean napkin and aluminum foil). Also, lay out paper baskets to arrange tacos in, or dinner plates, napkins, wine glasses, and a bottle of chilled Sutter Home White Zinfandel. If desired, decorate table with a vase of colorful flowers or any decorative Tex-Mex item. Eat and drink to the sound of a nice music soundtrack, and have a great time. Shrimp dinners are a personal favorite. This scrumptious fajita recipe has summertime as a by-line! This sounds like a winning evening! Wine and fajitas would make anyone’s night! Perfect treat for week dinner ! Thank you so much ! Aw. Such an so romantic dinner! I love the way you guys took advantage of your time, that’s so lovely! !